Do you know someone who could use help with their resume? their LinkedIn profile? their career? Tell us what they need, and we’ll contact you to craft a gift package specifically for your friend, colleague or loved one. Give the gift of confidence. What type of mentoring might they need? 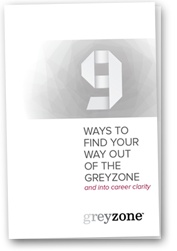 Get career clarity with nine proven ideas to get out of the greyzone. If you are stuck or confused about your career, this guide could very well get you back on track!